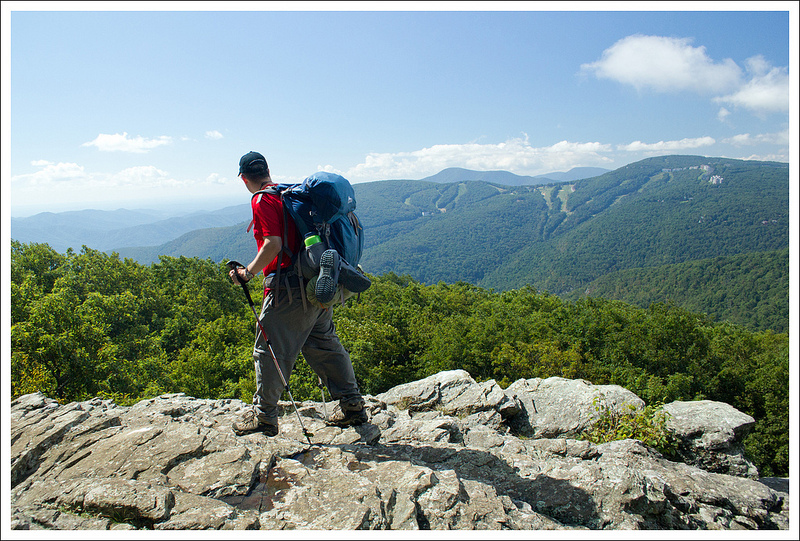 This 14.5 mile section of the Appalachian Trail includes great views of Wintergreen Resort from Humpback Mountain. The campsite for the evening is the Paul C. Wolfe Memorial Shelter, which is located on the bank of lovely, rushing Mill Creek. Adam traverses Humpback Mountain. Below: We found trail magic right away on our hike; Adam climbing the southern side of Humpback Mountain; Rock walls along the trail. 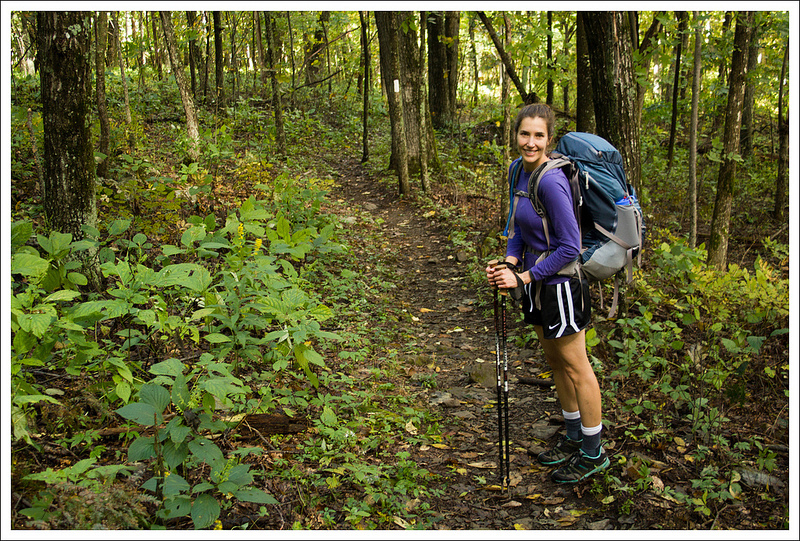 For Christine’s birthday this year, we decided to do a quick overnight backpacking trip along the Appalachian Trail. Following an all-day soaking rain and a cold front on Saturday, we had ideal weather for hiking and camping on Sunday into Monday – low humidity, clear skies, daytime highs in the 70s and a nighttime low near 45. It was perfect! We started our morning with a big breakfast at Thunderbird Café and then made the 40 minute drive to the trailhead. For this hike, we left one car parked in the small lot near where the Blue Ridge Parkway (BRP) crosses I-64 and Rt250. From there, we drove our second vehicle to the Dripping Rock parking area at mile 9.6 on the BRP. The name Dripping Rock refers to the small spring adjacent to the parking area. Supposedly, it was a water source well-used by Monocan Indians en route to summer hunting grounds. The AT crosses the parkway at this point, so it’s an easy place to hop on without using any access trails or spurs. The hike starts out climbing gently uphill through the woods. 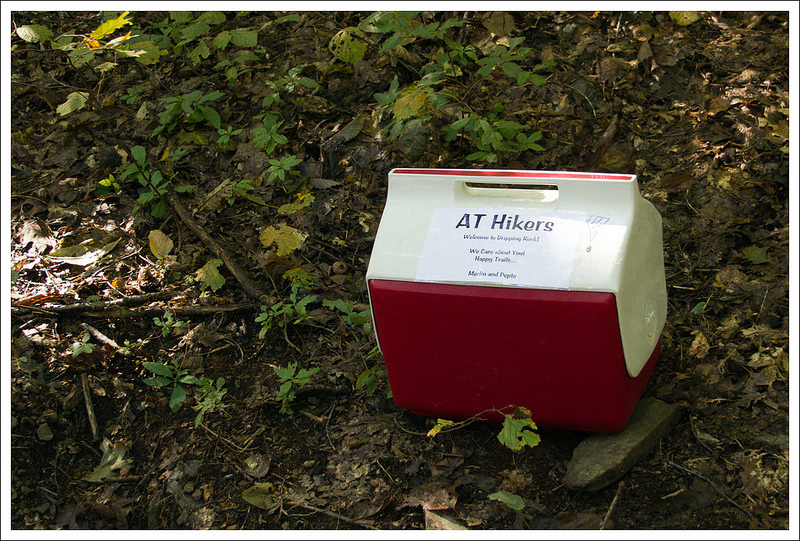 Almost immediately, we spotted a small cooler alongside the trail – trail magic! We didn’t need (or take) any trail magic on our hike, but we were curious so we opened the cooler to see what was inside. We found a log book, a camera, a small whiteboard, a bottle of ibuprofen and a nice supply of granola bars. 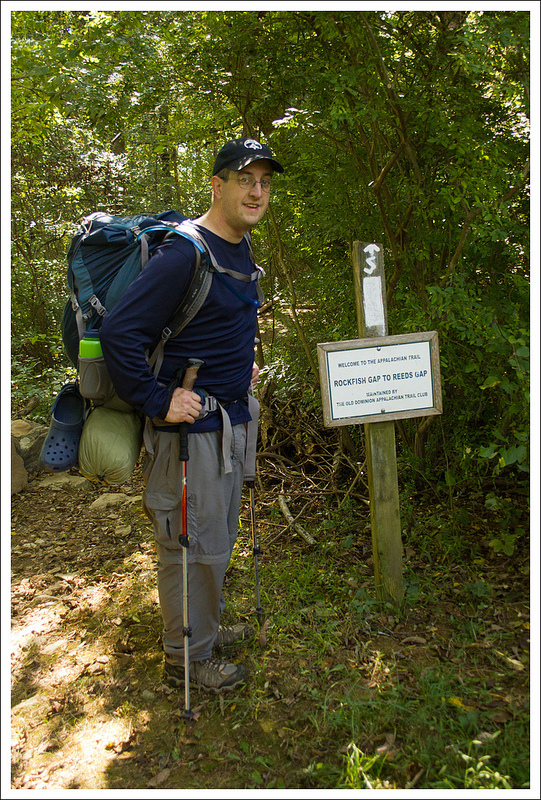 The camera and whiteboard were provided so that hikers could take photos with their trail names. A couple tenths of a mile down the trail, we passed even more trail magic in the form of 2 liter-sized bottles of tap water from Wintergreen Resort. Typically by September, streams and springs in the Shenandoah Valley are dry or running very low, so the free, clean water would be quite welcome. The bottles were situated next to one of the trail’s spring-fed water sources. We noticed the sign marking the spring indicated that water might be contaminated and should be filtered or boiled. The sign included an outline drawing of a moose, and we both found it comical to think about the implausibility of Virginia water being contaminated by a moose. 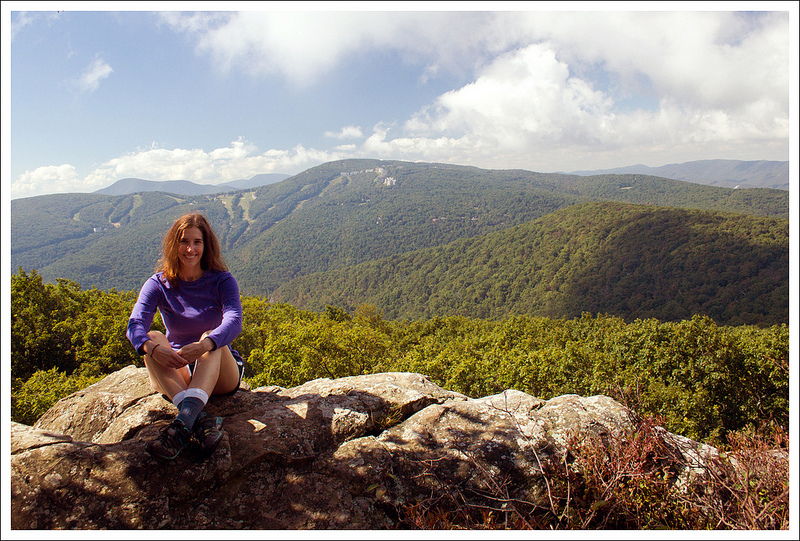 Christine enjoys the outcropping overlooking Wintergreen. 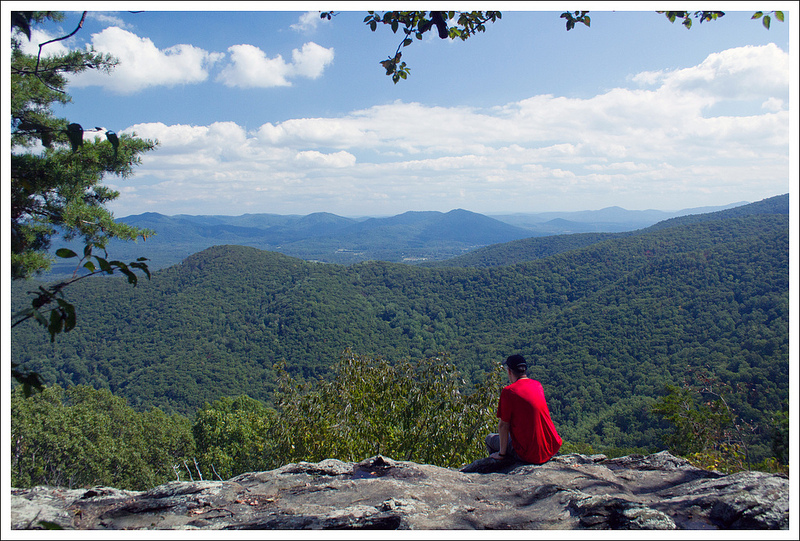 Below: Hiking up Humpback Mountain; Adam checks out the view of Wintergreen; Pretty views. The hike continued gradually uphill along the side of Humpback Mountain. We saw several nice campsites along the trail. Soon after that, the views started to open up. We didn’t really have any expectations for great views on this hike. We figured we might take the side trail to Humpback Rocks and eat lunch there. We also knew from past hikes on Dobie Mountain that we’d be passing one decent overlook at Glass Hollow. However, we were pleasantly surprised to find spectacular views along the rocky, spiny ridge of Humpback Mountain. 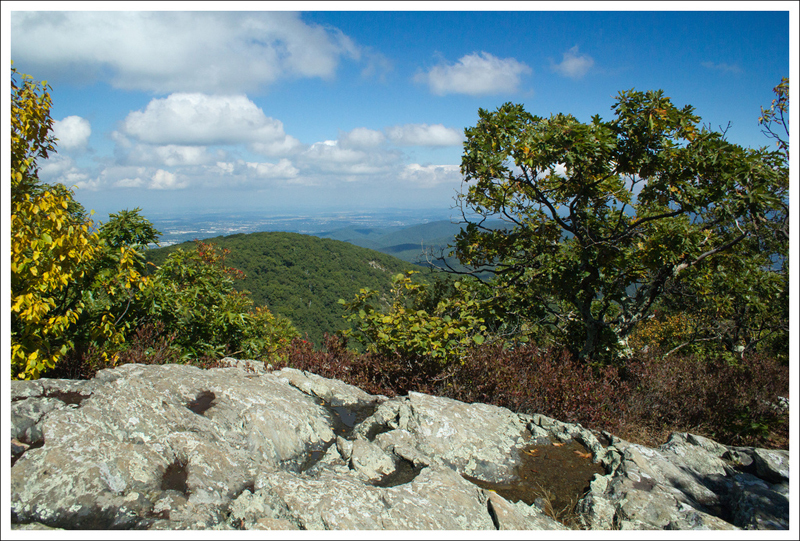 These views are about 2.5 miles from the better known outcropping of Humpback Rocks, and we thought they were even nicer! The crowds, graffiti and car noise always take away from the experience at Humpback Rocks. We had this lofty ridge all to ourselves. We took some time to take off our heavy packs and enjoy the view. We could see the Priest, Three Ridges and the slopes of Wintergreen Resort. When we got home, we read more about this section of the trail and learned that the view is named Battery Cliff, because the condos on the slopes of Wintergreen look like fortifications from a distance. The rocks on the cliffs are Catoctin greenstone formed in an ancient volcanic eruption. When you sit on these rocks and look across to Wintergreen, you’re looking over to where the Appalachian Trail used to traverse the mountains. Five miles of the trail used to cross the resort. But in 1983, the resort sold the land to private developers – basically pulling the rug out from under the Appalachian Trail Conservancy. Luckily, the organization was able to quickly pull funds together and preserve the land across Humpback Mountain – where the trail currently sits. 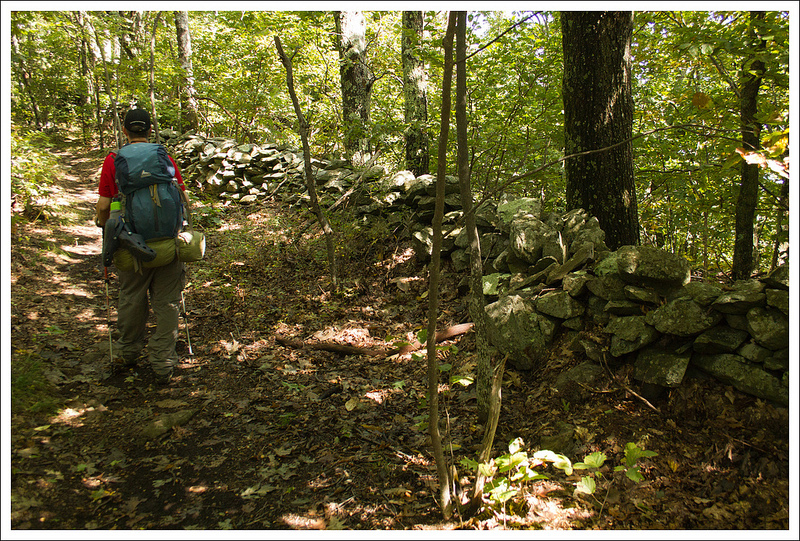 Leaving the open ridge, we dipped back into the woods and continued walking along a long, impressive stretch of stone ‘hog wall’. People living in the area before the establishment of the parkway built these long walls to roughly mark property and attempt to contain livestock. 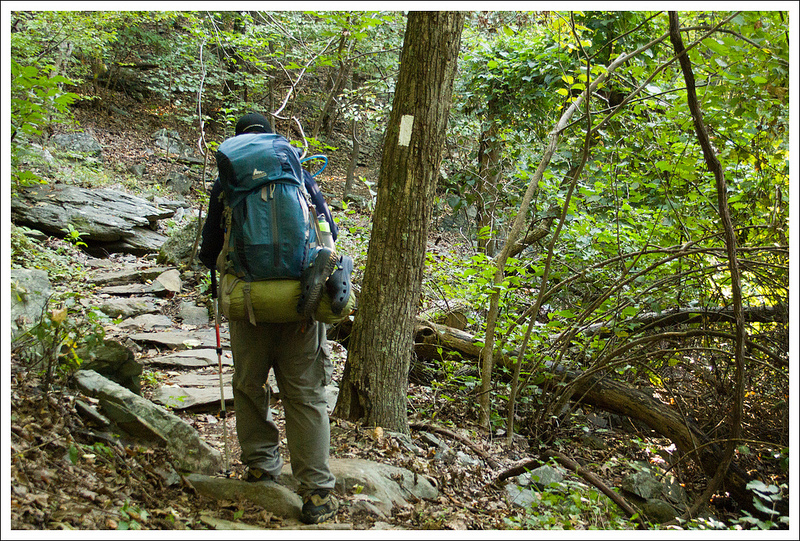 Eventually we arrived at a junction, one direction headed toward Humpback Rock and the other continued downhill along the Appalachian Trail. We decided to skip the extra mileage it would take to visit the Rock and continue toward our destination. We’ve seen the Rocks many times and didn’t really want to face the crowds that arrive with beautiful-weather Sundays. Adam walks along one of the many hog walls. As we walked downhill, we started contemplating our lunch break. We decided that the next spot with good ‘sitting rocks’ we’d stop for lunch. As it turned out, the next rocks we found were just a few, big random flat boulders right alongside the trail. 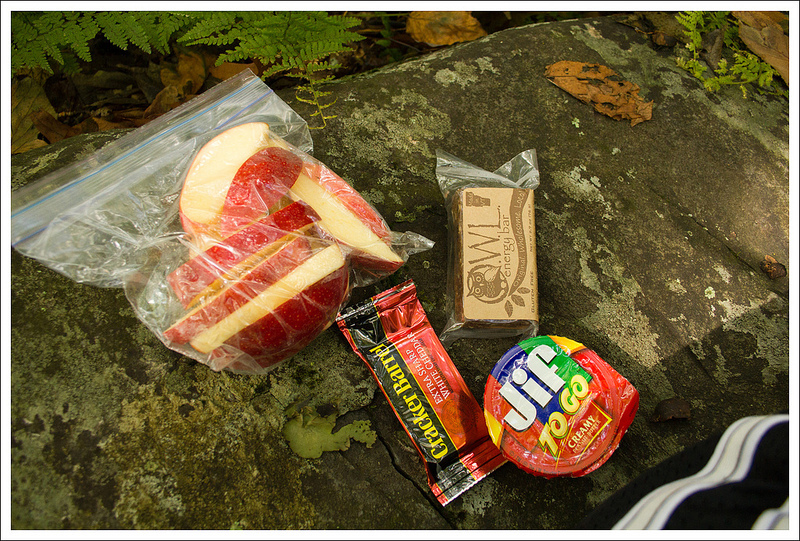 We had lunch of apples, peanut butter, cheese, and energy bars. As we ate lunch, two groups of people passed us – a couple with their dog and a man who had just visited his daughter at JMU’s family weekend. All in all, we only saw a total of eight people over the entire ten miles of hiking that day. The solitude was nice! After lunch, we continued the 5.5 mile descent toward our evening stop point. The trail was in great shape and the downhill was easy going. 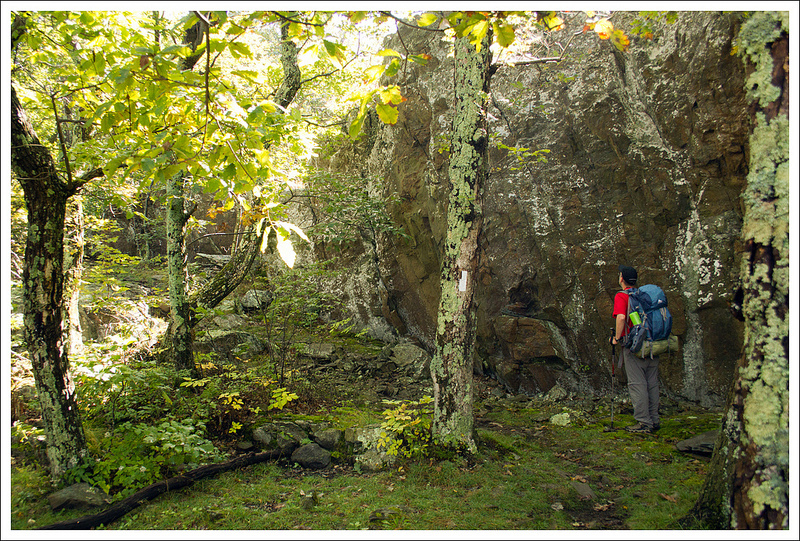 At the bottom of Humpback Mountain, the Appalachian Trail intersects with the Howardsville Turnpike – an old toll road that was heavily used to transport goods before the Civil War. It’s long been reclaimed by the forest, but the wide, flatness of the trail still has the definite feel of a well-traveled road. 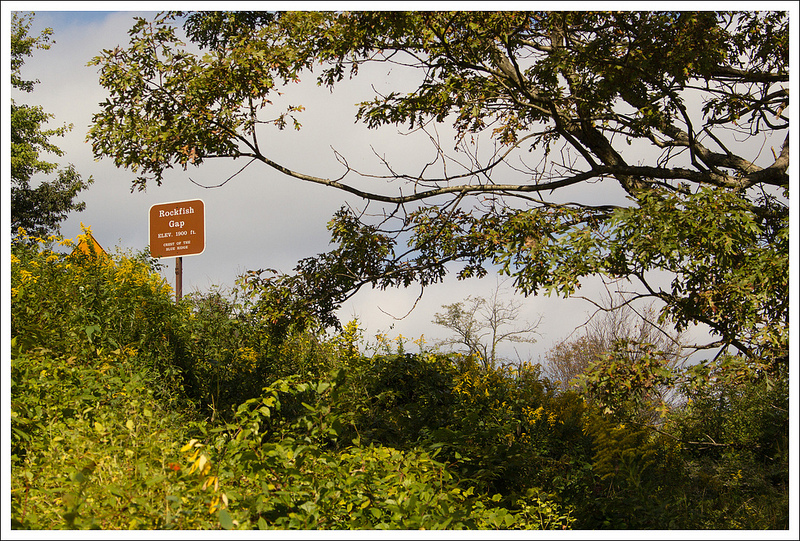 We continued along the Appalachian Trail until we spotted a small sign marking the Glass Hollow overlook. We followed the short access trail and spent a good twenty minutes relaxing on the beautiful rocky viewpoint. The views this time were much clearer than they had been two years ago when we visited. Taking in the view at Glass Hollow. 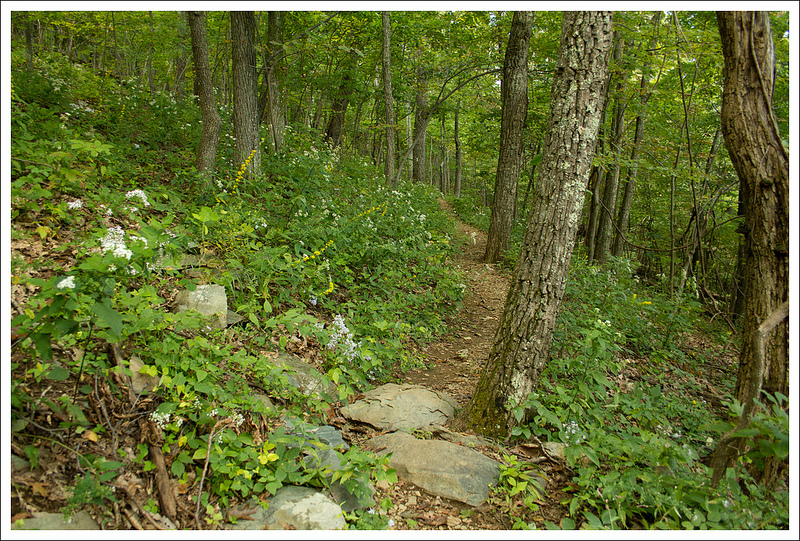 Below: Trail lunch, AT logos carved on deadfall; Pretty trail with late season wildflowers. 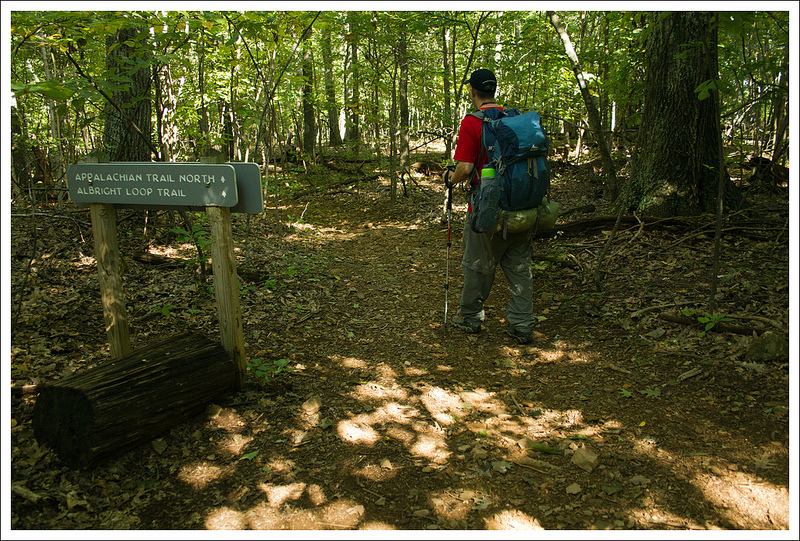 After leaving the overlook, we continued along the Appalachian Trail, passing the junction with the Albright Loop Trail – a popular day hike in this area. From this junction, you can follow the Albright Trail for two miles back to Humpback Rocks parking. 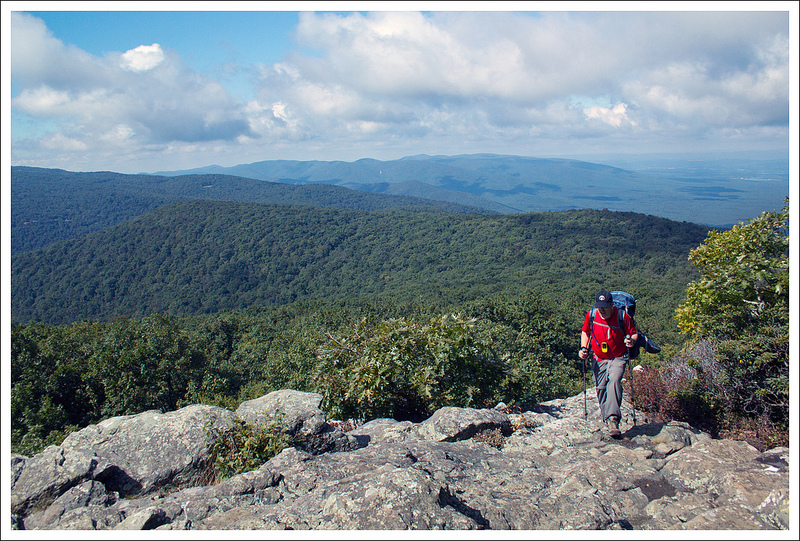 We continued northbound on the Appalachian Trail, descending Dobie Mountain. The trail follows a series of gradual, well-graded switchbacks. There is one nice view of the valley about halfway down the mountain. Eventually, we started hearing the sounds of running water through the trees. After crossing Mill Creek, we arrived at our stop point for the evening – the Paul C. Wolfe shelter. This shelter is one of the nicest we’ve seen. The location is beautiful, the picnic table is on the porch and the shelter has sidelights, so it’s bright and cheerful inside. So many shelters are gloomy and dark. We will caution you – the privy at Paul C. Wolfe shelter is kind of weird – the door is only a half-door. When you sit on the toilet, you have a nice view – but people can also see you sitting there. We were the first campers to arrive for the night, so we got a prime campsite near the banks of Mill Creek. We had our own established fire pit and our own bear pole – fancy! We immediately got started setting up camp and taking care of necessary chores. Mill Creek was running beautifully, so we had a clear, cool water source to filter from. We decided to take our dinner up to the shelter so we could use the picnic table for meal prep. Dinner consisted of pepper steak, wine and dark chocolate cheesecake. As we were finishing up dinner, a southbound thru-hiker named Nightwalker arrived at camp. He told us he had hiked almost 30 miles that day. He was from the Boston area and freshly out of high school. We chatted with him a bit and marveled at him eating huge handfuls of candy corn mixed with Skittles. He had the look of a true trail-weathered hiker – beard, tattered long-johns and feet held together by duct tape. When the sun was going down, we headed back to our own camp. Despite the heavy rains the night before, we were able to find enough old wood to have a small campfire for a while. We heard another southbound hiker arrive sometime after sunset, but we never met him. With the temperatures dropping with the darkness, we headed to bed around 9:00. Both of us slept pretty well, but Christine woke up around 3:00 a.m., struggling to close both of the doors in the tent fly. It was in the upper 30’s and she’s a cold sleeper. Our nice little campfire. 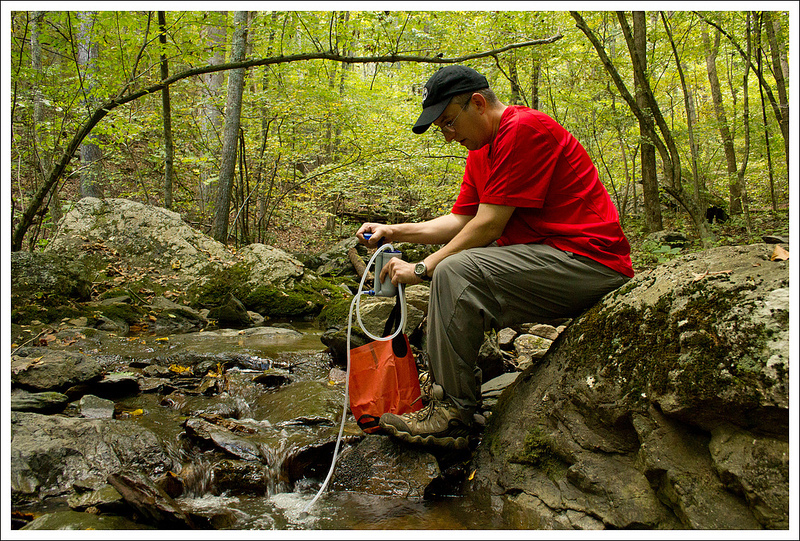 Below: Adam filtering water; The Paul C. Wolfe Shelter; The steep climb that starts Day 2. We were up at first light, but noticed both the thru-hikers were still sleeping. We didn’t want to disturb them, so we cooked our breakfast of oatmeal, cheese, coffee and hot chocolate near the fire pit at our campsite. We were packed up and back on the trail within 45 minutes of waking up. The morning’s hike consisted of a rather steep climb up Elk Mountain. From the back of the shelter, the trail climbed almost straight up via a series of switchbacks. We had about 1000 feet of climbing in just about a mile. A8fter that, the remainder of the hike was more moderate or even gently downhill. The remnants of an old cabin sit right along the trail. Below: Approaching Rockfish Gap; We can see Rt. 250; Waynesboro’s great network of trail angels. The five miles of trail back to Rockfish Gap are largely unremarkable; just a nice walk through the woods. There are a few small stream crossings, but no views along the way. The one noteworthy feature would probably be the ruins of an old cabin, about 1.7 miles north of Paul C. Wolfe. The chimney and hearth are still standing right alongside the trail. Evidently, there is also a cemetery for the Lowe family and additional cabin ruins somewhere east of the trail, but we didn’t see it. The trail exits onto Route 250 at Rockfish Gap through an opening in the guardrail. 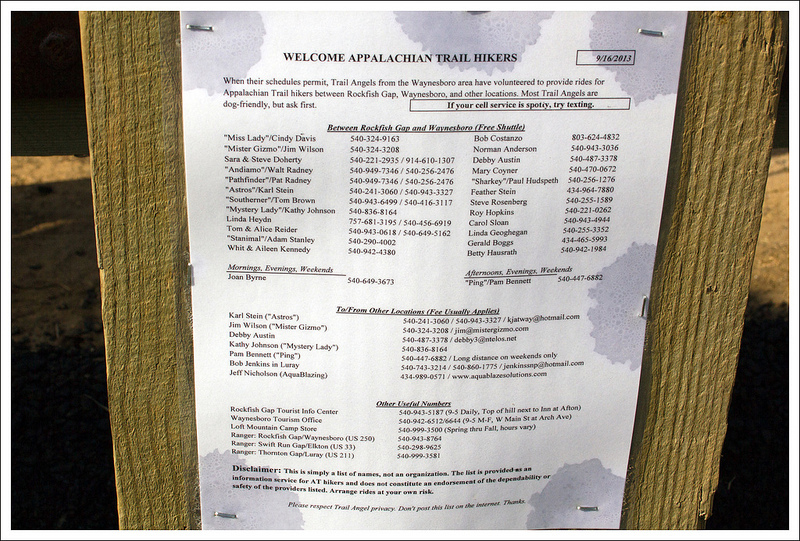 Thru-hikers can find lists of trail angels at the guardrail opening. Waynesboro has one of the best organized trail angel networks along the AT. It’s easy to find a ride or shelter at this point on the trail. We arrived back to our car around 10:30 in the morning. By the time we shuttled back to our car parked at Dripping Rock, we were already thinking about lunch. We realized how close we were to Devil’s Backbone Brewery and decided it was a perfect place to wrap up our backpacking weekend. We had a huge lunch – beers, a big soft pretzel to share, and sandwiches (French Dip for Christine, BBQ for Adam). After lunch, we decided to take Rt. 151 back to Waynesboro. This allowed us to also pass Bold Rock Cidery. It’s definitely worth a stop if you enjoy hard cider. Since it was a Monday, we were the only people there. We got to go behind the scenes into the cider pressing room and the fermentation/bottling facility. That was really neat! 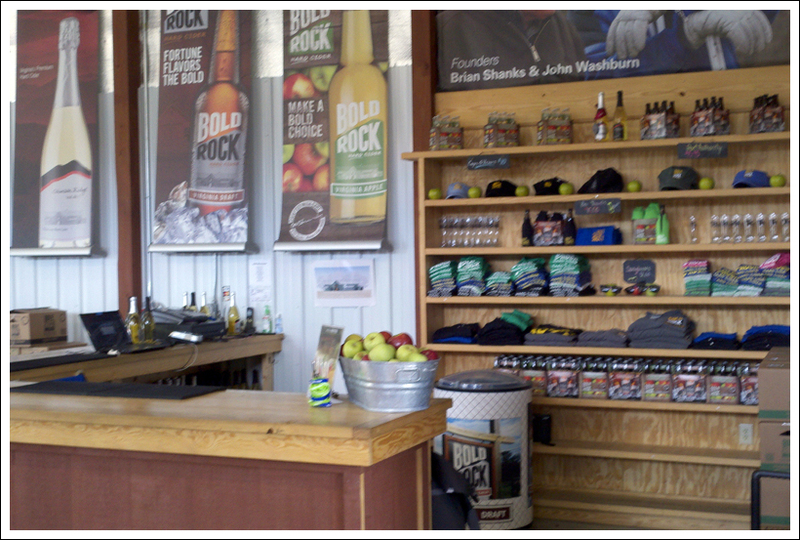 The tasting room at Bold Rock. 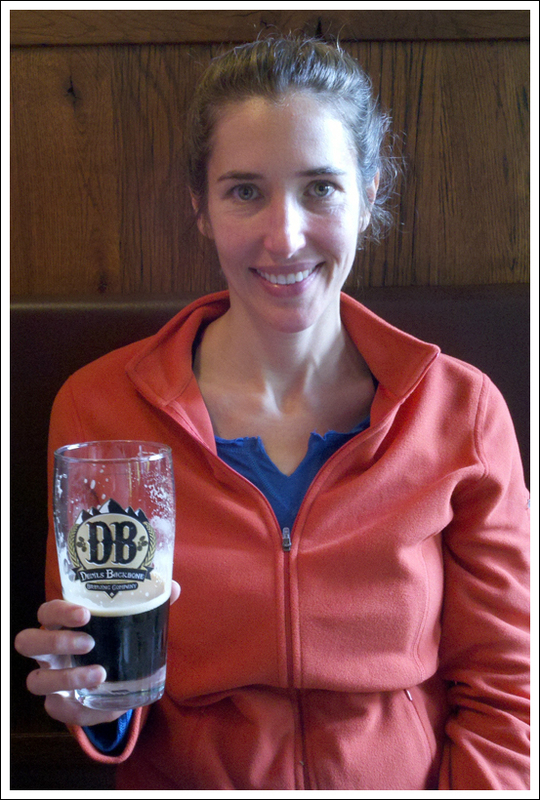 Below: Enjoying a post-hike beer at Devil’s Backbone. Difficulty – 2. This is an easy backpacking trip with moderate, well-graded climbing. Trail Conditions – 4.5. Trails are in excellent shape. Views – 4. Views from Humpback Mountain and Glass Hollow are beautiful! Streams/Waterfalls – 3. Mill Creek is pretty and a great water source. There is a small waterfall and swimming hole downstream from the shelter. Wildlife – 2. We saw a few deer and heard owls at night. Ease to Navigate – 4. There are several intersections/junctions to pay attention to, but following the white blazes is pretty easy. Solitude – 4. Because we avoided Humpback Rock, we only saw a small handful of people on a beautiful Sunday. 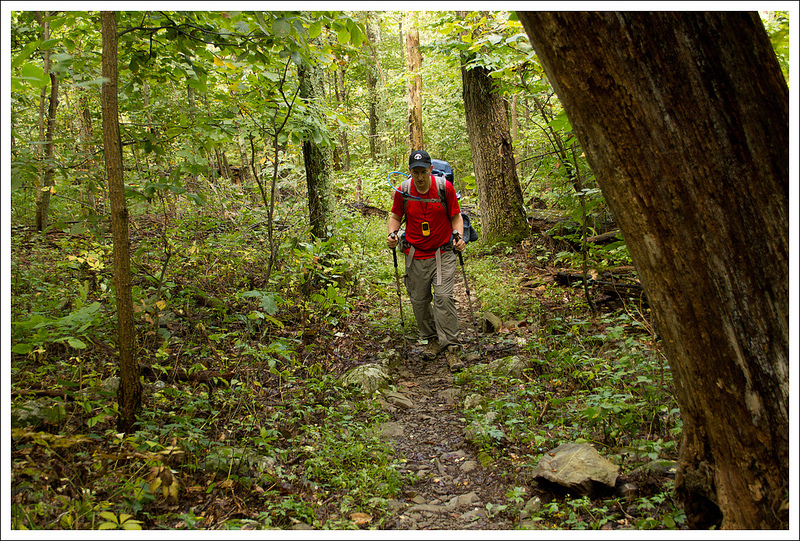 Directions to trailhead: Follow the Blue Ridge Parkway to mile 9.6. Park in the small Dripping Rock parking area. A fantastic hike!! Glad you could join us for the day hike section!! Yes – such a great day! I heard you guys nabbed a great campsite! Thinking about starting this at reeds gap around 4pm (driving out from VA Beach after church). 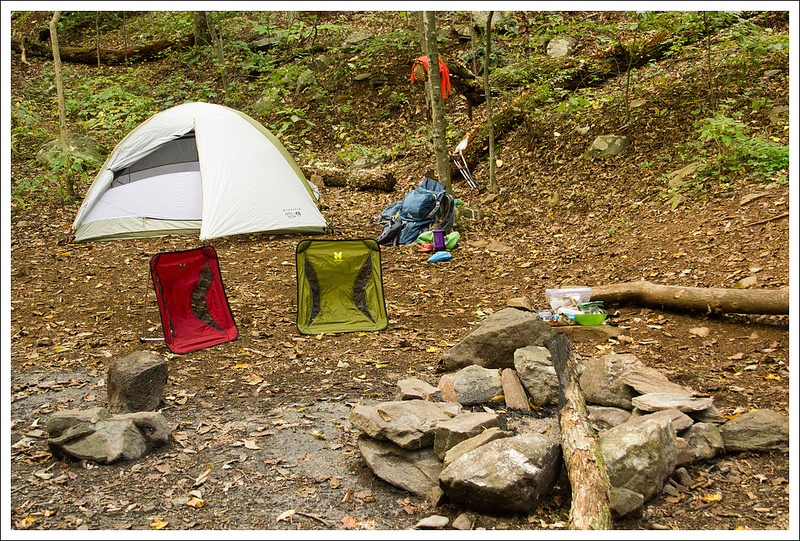 Anyone know if there are any decent camping spots between reeds gap and dripping rock? 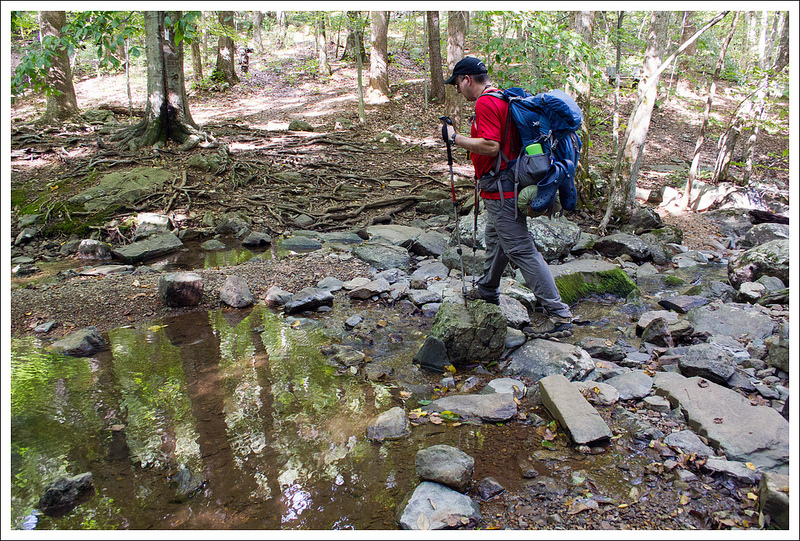 Check out our Reeds Gap to Dripping Rock post for more specifics about that section: https://virginiatrailguide.com/2015/03/22/appalachian-trail-reeds-gap-to-dripping-rock/ As far as camping there… not really – this section of trail is pretty rocky with a steep grade up to the parkway on one side for most of the route. There is also a mile marked/designated NO CAMPING near Cedar Cliffs. You might be able to get one tent into a flat spot near Rock Point overlook, but that’s a big maybe! It’s really not a great stretch to camp. If you can push on two miles past Dripping Rock (and it’s an easy two miles), there is a superb (dry) campsite overlooking the ski slopes of Wintergreen. Thanks Christine that’s very helpful. Maybe we’ll just tackle the hike as you have it laid out rather than getting too aggressive. I doubt we could get 6 miles in to the site you mentioned the first night. Sounds like a great trip. Looking at doing in october but struggling to map the lots. How far was it between then by car? If you put these coordinates into Google Maps and then turn on the Google Earth view (instead of the street map), you can actually see the lots with cars in them. It’s about a 15 minute ride by car along the Blue Ridge Parkway to get from one lot to the other. Just did this hike on Saturday in preparation for the West Highland Way in a couple of weeks, great hike but brutal in the heat – especially going up Elk Mountain. We did the whole thing in about 7.5 hours, and saw deer, a Barred Owl, rattlesnakes, and I think we heard a bear jumping/falling from a tree. Sadly we didn’t have time for a recovery beer at Devils Backbone, but a couple of cans of Champion Shower Beer at the end was most welcome. Shower Beer is a good choice after a hike on a hot day! Glad you enjoyed the hike! Even though it’s hard to lay out but the Lowe cemetery you mentioned in the article are my relatives (my mother’s mother was a Lowe before she was married ). I would be interested in any more pics you may have not posted. Hi Christine. 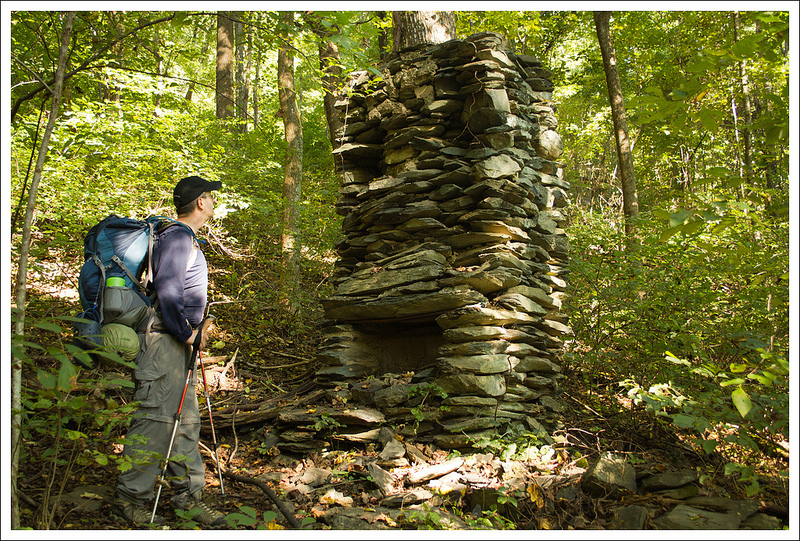 Not sure how accurate, but we were told by some men in their 70’s/80’s who are from that area, that the Mayo cabin is actually NOT the chimney we see on the trail. The Mayo cabin is between the cemetery and the chimney, down the right hand side of the trail if you are hiking north. We have actually hiked down to the cabin twice (the last time being yesterday:). When foliage is full, it is very difficult to find. The cabin still has a tin roof (collapsed in), log walls, and is supported on rocks. As for the cemetery: It is approximately a mile north of the Paul Wolfe Shelter, on the right hand side of the trail. It is now very easy to find, as the Old Dominion ATC group has cleaned the area so people can see it more easily. I am not a hiker if you exclude grouse hunting in WV however, thanks for finding the Mayo cabin. Some history for you. Joseph Thompson Mayo, a brother to my gg grandfather first settled there in 1831. He eventually owned 106 acres. His property was in the humpback region where the blue ridge parkway intersects the Nelson and Augusta county line as one corner of his land was in Augusta and the rest in Nelson county. He was born 1780 and fought in the war of 1812. He comes from Palmyra Va. and son of Joseph Mayo a 2nd Lieutenant in the Revolutionary war. He is the grandson of James Mayo 1711-1776 born in Middlesex Colony and son of Valentine Mayo who witnessed a will there in 1687. 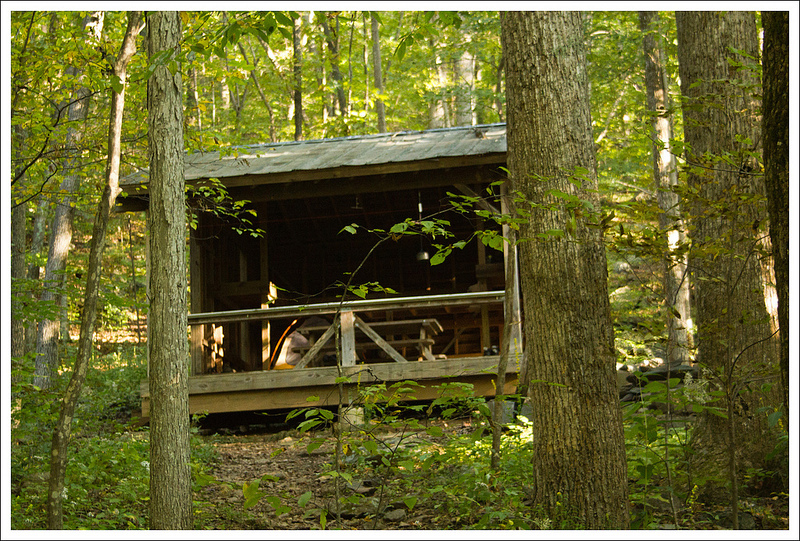 This cabin could be his or it could be one of his two sons, William Walker Mayo or Joseph Samuel Mayo. I would like to see it sometime. How far is it from the trail opening and what is the shortest directions to it? Hi Charlie… It’s probably about a 4 mile hike in in from Rockfish Gap. You would head south on the AT. Nice write up. I find it interesting that most of the A.T. between Dripping Rock and Rockfish Gap is relatively new. From Rockfish to the shelter was rerouted in the 1990’s, and from Dobie to the Humpback Rocks Trail is even more recent than that. I am not sure that any other section of the A.T. in Virginia has had so much of the trail re-routed in this timeframe. 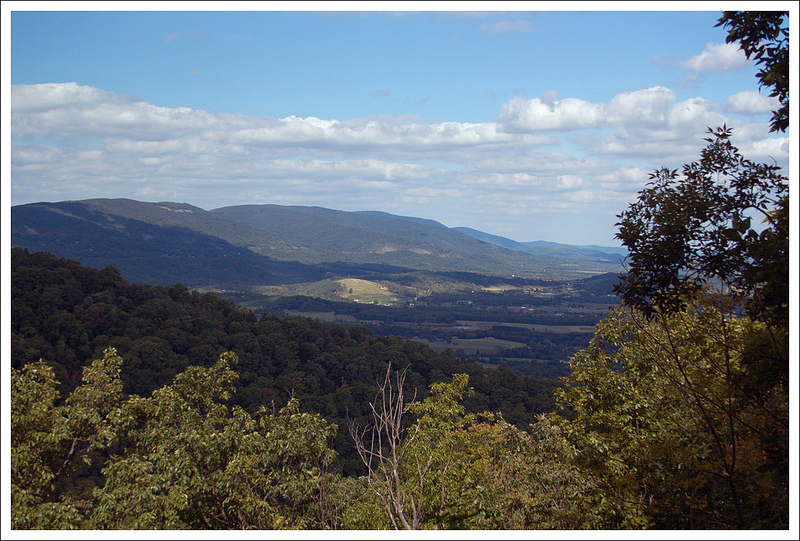 There is a trail in Wintergreen called the “Old A.T. Trail” that has a couple of very nice overlooks. I like it better than the newer section, but it is difficult to link back up with the current A.T. alignment. Not sure why Wintergreen wouldn’t trumpet and enhance its proximity to the A.T. by making this loop available to hikers – you would think it would be a good marketing move. I think that would be a great idea for Wintergreen, Jeff! The reroute near Dobie and Humpback is something I remember changing recently, too. Thanks for the great hike report. I backpacked this section with Bryce and another friend a week ago. It was 19°F on Sunday morning. A bit chilly. 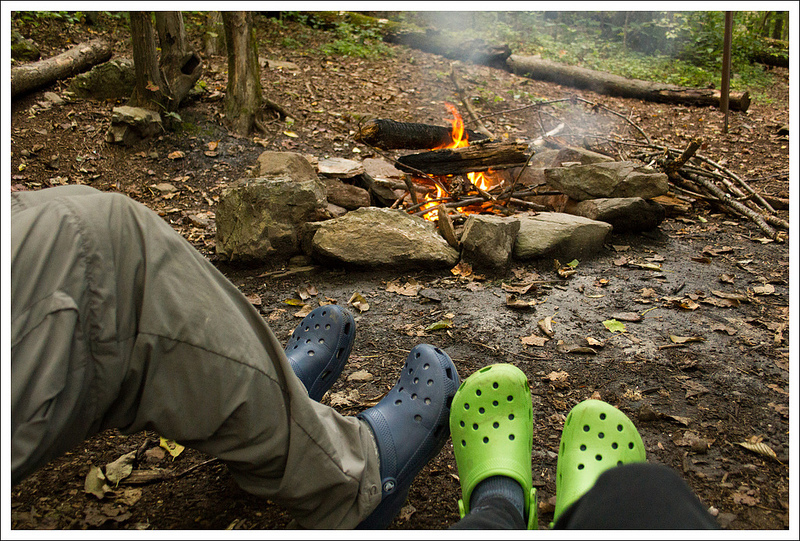 Surprisingly, six additional hikers showed up and we had a great time around the fire, especially when a skunk was circling our camp. Thanks for the additional info about the cabin and the old toll road. Fascinating!! Great write up guys, been through that section a few times and we did it as as backpack a few weeks ago. A great little section of the AT. Thanks, Bryce! The views from Humpback Mountain were really nice! Excellent trip report, as usual. Makes me want to do the same hike. Thanks for the details and for the wonderful phots. Thanks for the visit, Chuck! The views on this stretch were so much nicer than we expected – definitely worth a try!